It's both sporty and classy, which is hard to find. This watch would look great going out for beers with the guys or paired with a suit. It's a big watch - like all Swiss Legend watches - so getting it to fit under shirt cuffs might be an issue. Other than that, it's a great watch for everyday use. It may even become his new favorite watch. The black numbers on the silver-toned dial make it easy to read the time. The date is in the 4 position. Stopwatch functionality included. 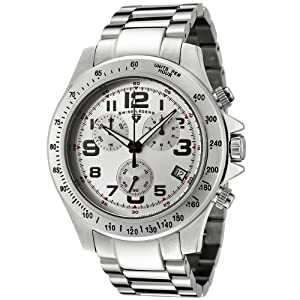 It's a cool watch for men and it makes a great gift. See more Swiss Legend Watches. I bought this watch as a gift to myself and I couldn’t be happier with my choice. I love it! I can use with formal or casual wear and it really looks nice either way. I could not help but notice other people glance at this watch. And the price is amazing too!